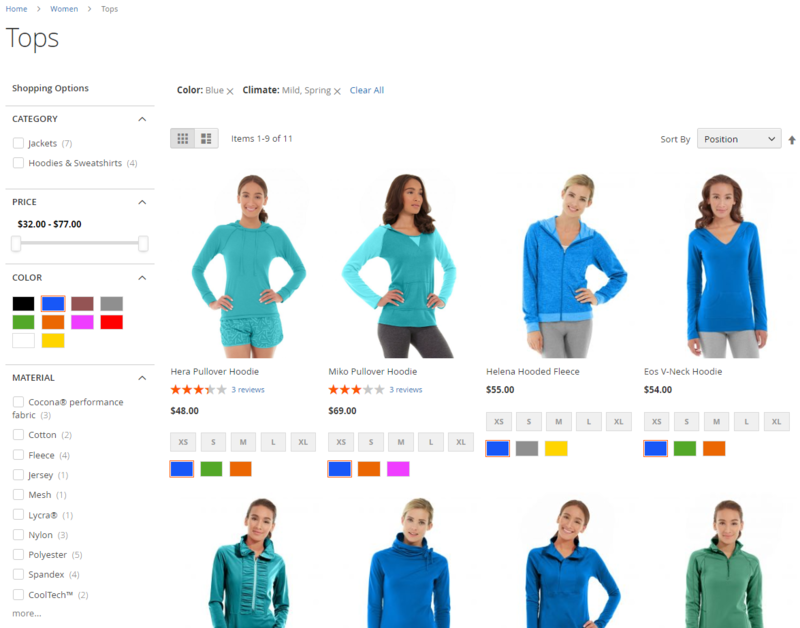 Since the Layered Navigation Magento 2 extension uses AJAX technology, frontend users enjoy fast catalog search without page reloads when applying filters. Due to the Infinite Ajax Scroll feature, your store visitors will enjoy automatic loading of products, as well as get the option to click the ‘Load More’ button without page reload. 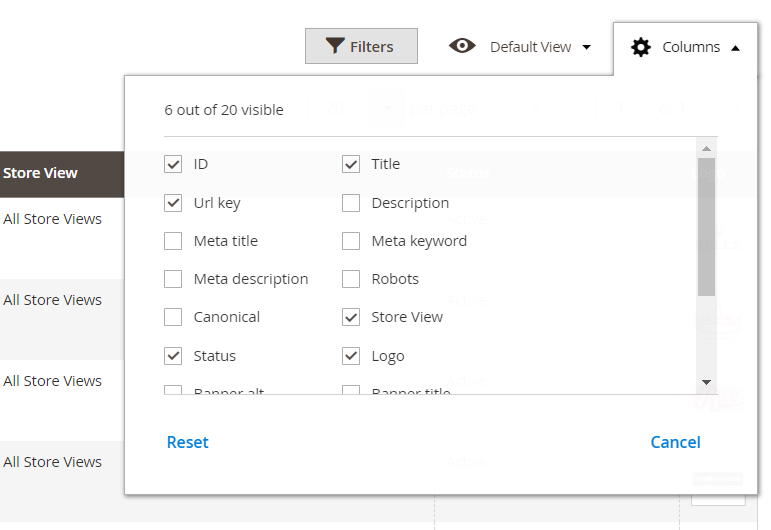 With the module installed on a web store, customers can select different attributes simultaneously for one filter, which is not available on the default Magento platform. 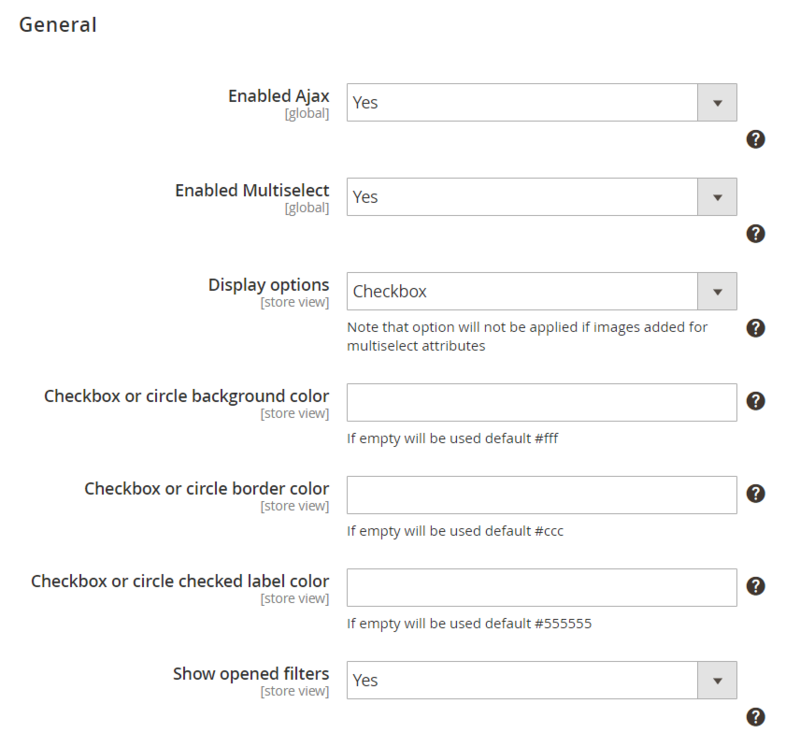 Besides, customers can use Clear All function to clear all chosen attributes or click X button to remove some of them. 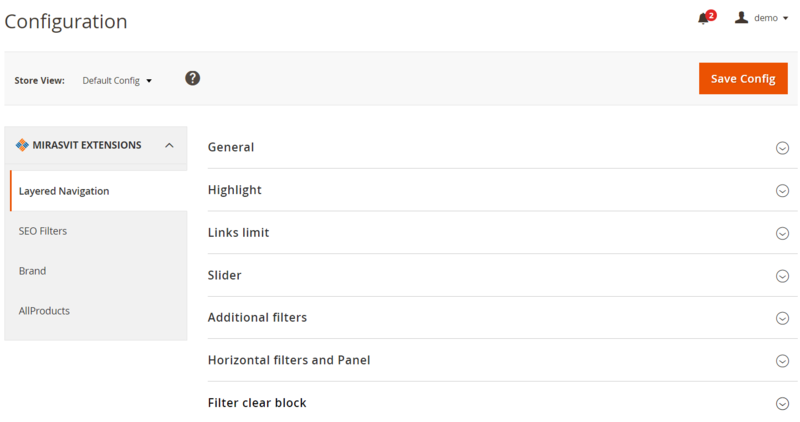 As for the appearance of filter blocks on the frontend, they can be positioned in the sidebar or horizontal bar with the filters hidden or visible. 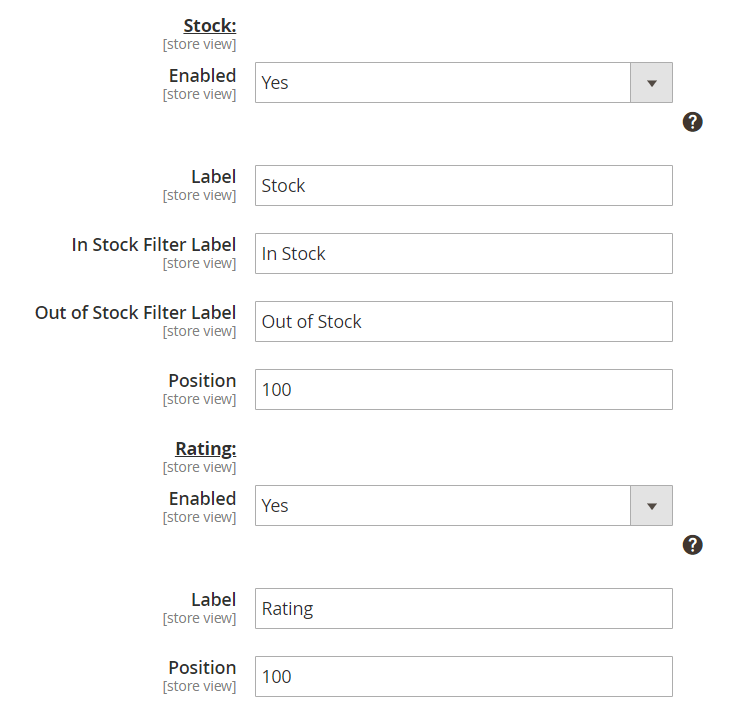 The Magento 2 module also allows using such additional filters like New Products (to promote new arrivals), On Sale (for discounted items), Stock (to show only in-stock products), and Rating (to filter products by the given rate). Moreover, website visitors can select a price range using the slider to find products with the specified cost. Another feature provided by the module is the ability to use images instead of text for a product option. In this way, for example, you could show brand logos for easier navigation in the catalog. 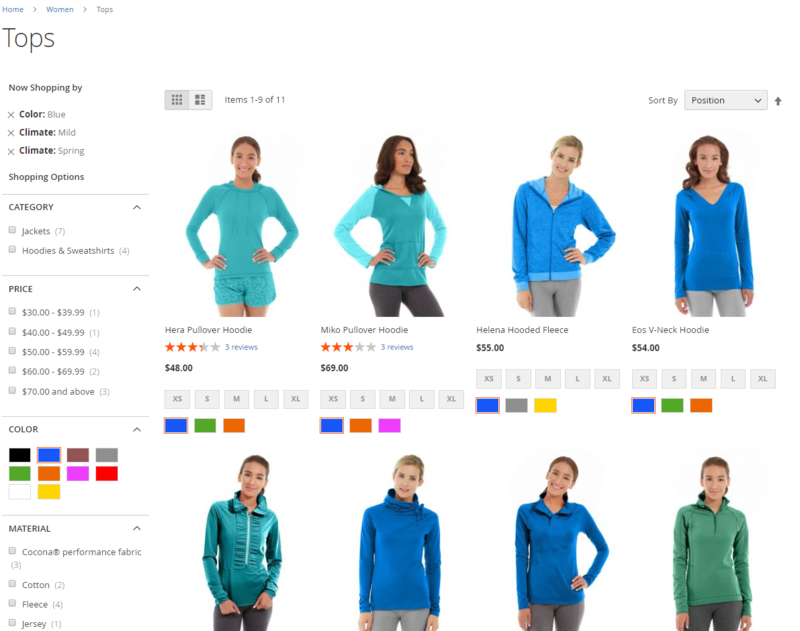 As for the brands, the Magento 2 layered navigation module allows users to create dedicated brand pages with customizable images, banners, titles, and descriptions. Moreover, you can add meta data to the branded pages to make them more SEO friendly for Google. Besides, you can create the All Brands page and provide more convenient navigation on your store for shoppers who are looking for specific branded goods. We should also mention that the module’s functionality allows placing a brand slider and “More from This Brand” block on a web store pages. Furthermore, the Layered Navigation extension improves SEO ranking of your ecommerce site, enabling you to replace native filtered category URLs with SEO friendly links. Another possibility provided by the Layered Navigation extension is listing all the products on a single page. Thus, you get advanced management of a product catalog. Now, let’s proceed to the backend part of Mirasvit Layered Navigation for Magento 2 to see how the things are done from the admin perspective. To configure the settings of the module, navigate to Stores -> Settings -> Configuration -> Mirasvit Extensions. Extension configuration is divided into four tabs: Layered Navigation, SEO Filters, Brand, and All Products. The Layered Navigation tab includes the following sections: General, Highlight, Links Limit, Slider, Additional Filters, Horizontal Filters and Panel, and Filter Clear Block. 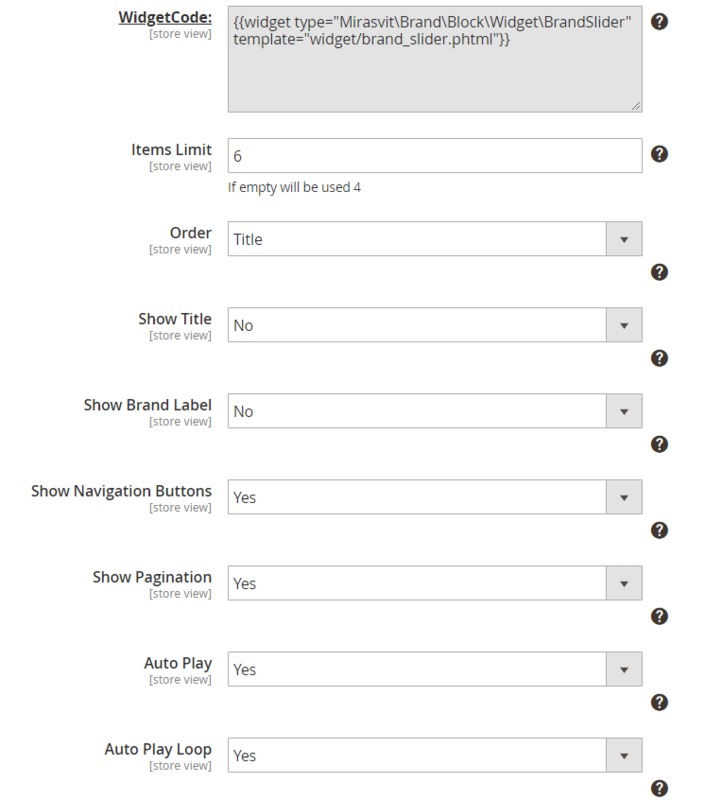 In the General section, you can enable/disable AJAX and multi-select feature for navigation filters, as well as select a widget display option from the drop-down list: Default, Simple Checkbox, Checkbox, or Circle. If you choose Checkbox or Circle option, it will open additional settings: specify the color for the widget’s background, border, and label. Here you can also allow showing opened filters at the top of the filtered products page. Highlight section lets you enable highlighting function for filter links and pick the highlight color. 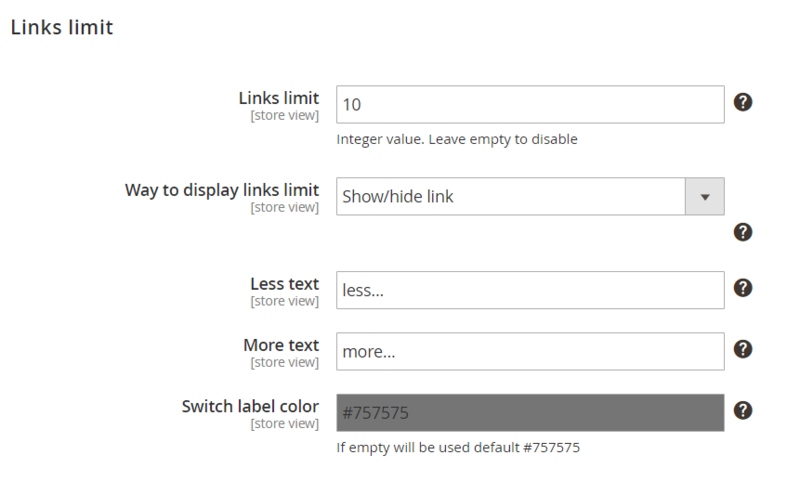 In Links Limit, you can set the number of links to be displayed for a filter and select how the links limit should be visible (Show/hide link or Scroll box). If you choose the first option, specify “Less text” and “More text” options to define the text button for collapsing and expanding filters, as well as a switch label color. If you choose the Scroll box option, specify the scroll height in pixels. 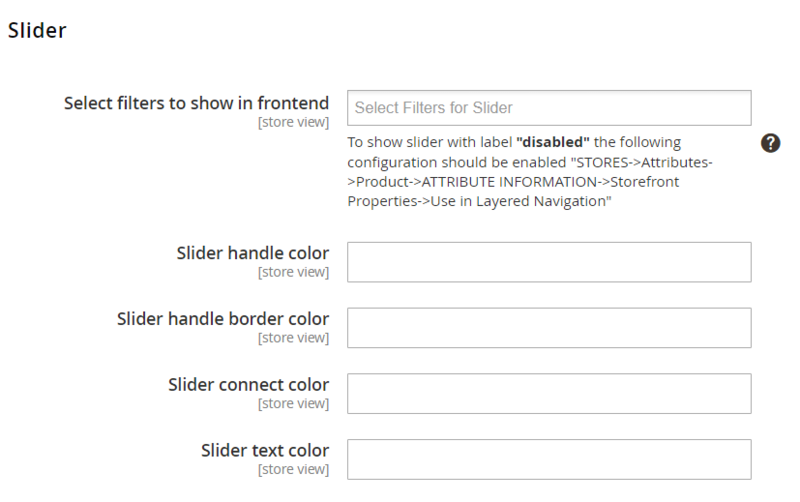 In the next section, you can set the slider for specific filters and specify the colors for slider handle, handle border, connect line, and text. 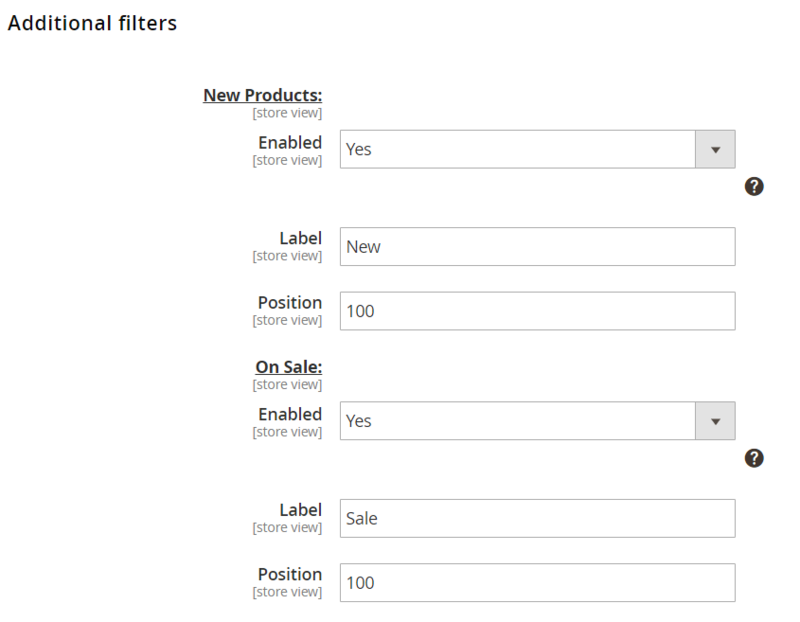 Then, you can enable/disable and configure options for four additional filters: New Products, On Sale, Stock, and Rating. For all these filters, you should specify a text label and position (to place it closer to the top or bottom). For the Stock filter, you can also define in stock and out of stock text labels separately. The Layered Navigation module also enables admins to place horizontal navigation filter bar and select particular filters to be shown there. You can also decide to hide horizontal filters depending on the screen size. 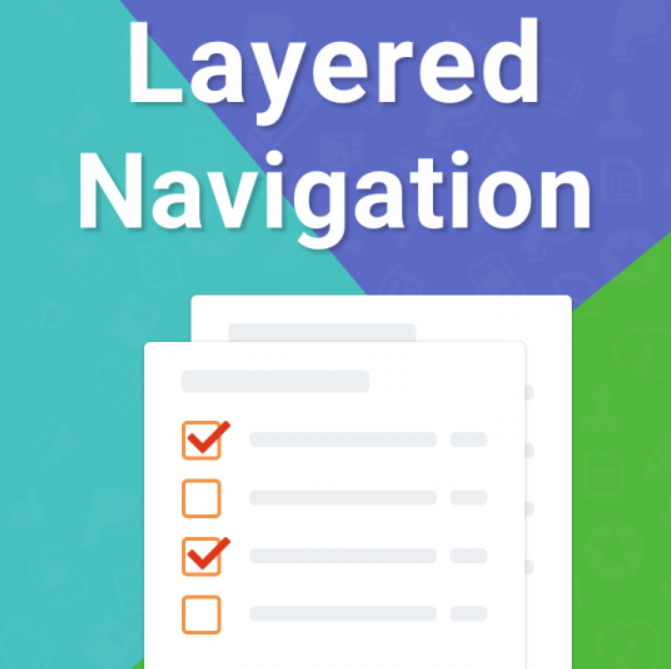 The last section of the Layered Navigation configuration lets users configure the filter clear block: choose its position (Default – in the sidebar, or Horizontal) and how filter attributes will be positioned. As for the SEO Filters tab, here you enable/disable the feature, as well as select a separator for filter names consisting of a few words. The Brand tab includes the following sections: General, Brand Page, All Brands Page, Brand Slider, More products from Brand, and Brand Logo and Tooltip. 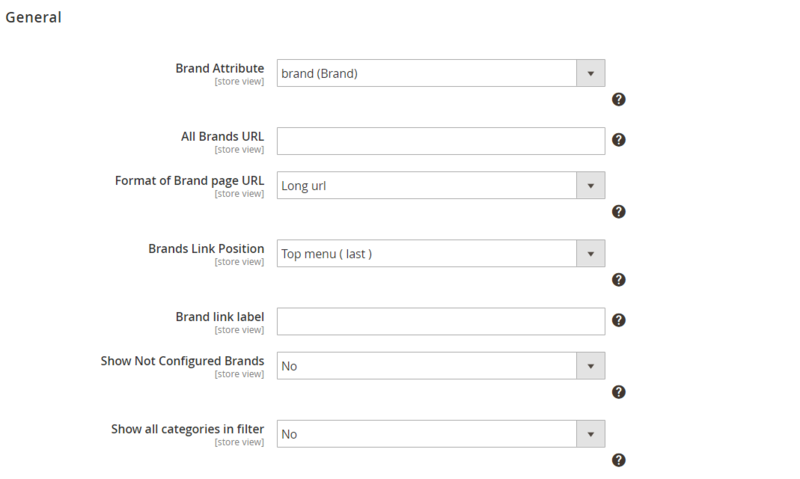 In the General settings, select a brand attribute, specify an URL for the all brands page and its format (long or short URL), choose a brands link position and label, as well as allow/disallow the display of simple brand pages and all categories in the filter. 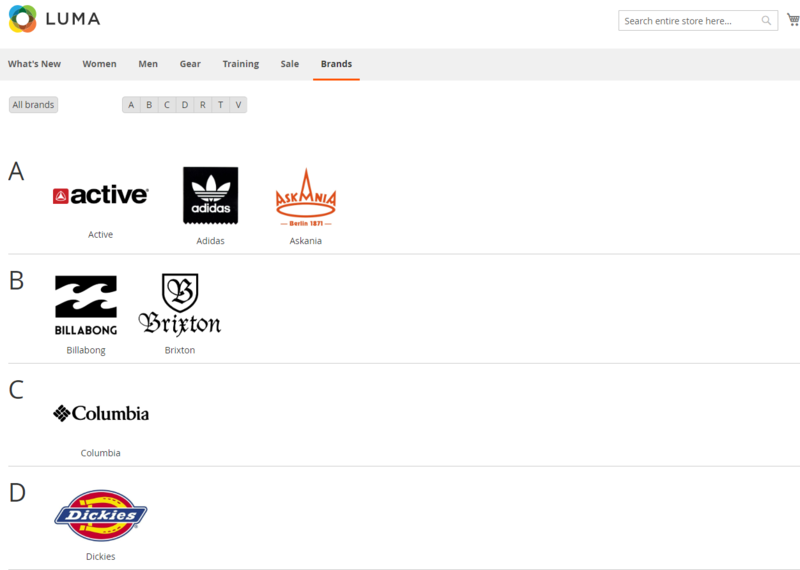 In the Brand Page section, you decide whether to show brand logos and descriptions. In the All Brands Page settings, you also select whether to show or hide brand logos and add meta title, keyword, and description. Here, you can also activate the autoplay feature and the autoplay loop, specify its interval, and enable/disable pause on hover. 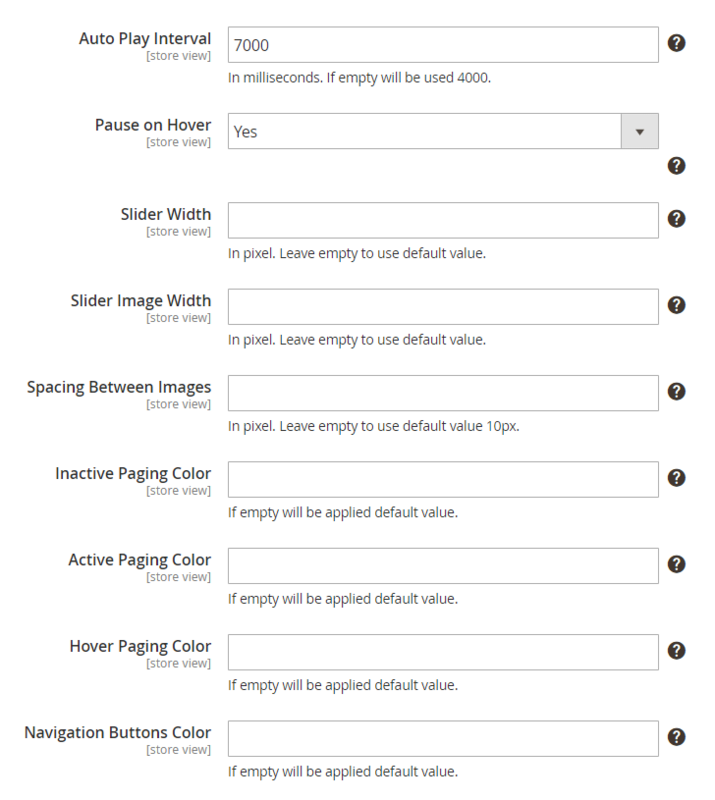 Next, set the width for the slider, images, and spacing between images in pixels, and the colors for inactive, active, and hover paging and navigation buttons. Then, you can activate ‘More from This Brand’ block on the product pages, create its title, and set the limit for the number of products displayed. In Brand Logo and Tooltip, you enable/disable the display of brand logos and tooltips in product listing and on product pages, set the width of the logo image and tooltip, as well as decide whether to show brand description on a product page. The All Products tab lets you enable the appropriate page on your website, create an URL for the All Products page, as well as its title and meta title, keywords, and description. Here, you also decide whether to show all or only top level categories in the filter. It is possible to set additional options for an individual attribute and, as we have already mentioned, add images to product attributes. To do this, go to Stores -> Attributes -> Product and select a required attribute. In the Attribute Information menu, select Storefront Properties. Here you can decide how to use the attribute in layered navigation: Filterable (with results), Filterable (no results), or No (not to use it in navigation). You can also allow using an attribute in filtered search results by selecting Yes in the appropriate option. There is also the Layered Navigation tab on the same page, where you can add images and decide whether to show them as the whole width or not and change the default name of a particular option. 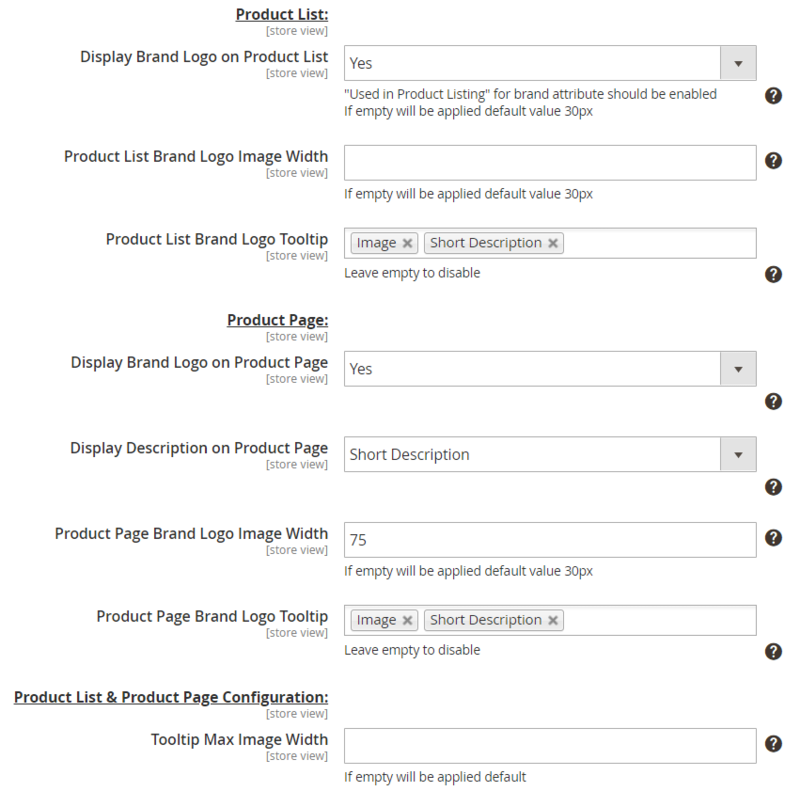 As for the brands management, you can view all existing brand pages in the appropriate grid. The grid shows each page’s ID, title, URL key, store view, status, and logo. It is possible to change statuses of a page and brand slider, as well as delete pages in bulk. You can include additional columns in the grid from the Columns drop-down. When creating a new brand page, you should configure its settings in 5 sections: General Information, Meta Data, Banner, Banner slider, and Additional Data. 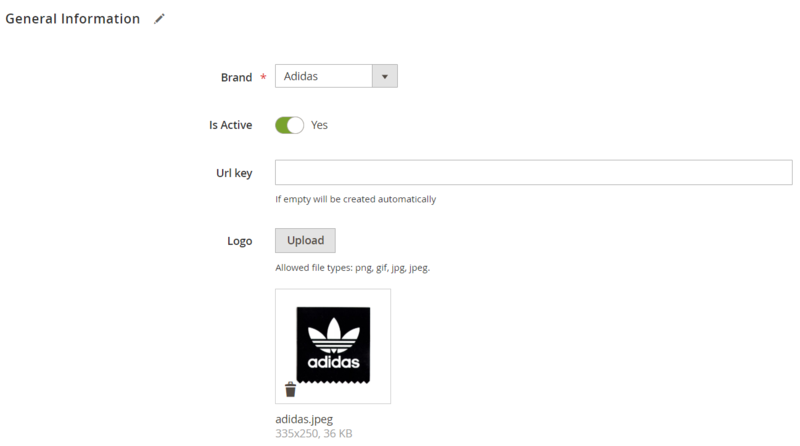 First, select a brand, set its status to Active, create an URL key, and upload a logo image. Then, create a page’s title and description and select store views where it will be visible. Next, specify meta data: title, keywords, and description. In the Banner tab, you specify the alt text and title for the banner placed on the brand page, upload an image, and select the banner position. The next set of options lets you decide whether to show the configured brand in the brands slider and specify its position. In Additional Data, choose robots and specify a canonical URL and short description. Now, let’s see how the extension’s layered navigation filters look on the frontend. On the page, customers can filter brands by the first letter in the title. When they find a brand they are interested in, they can open a dedicated brand page by clicking on the brand’s logo. As we’ve already mentioned in the backend section of our Mirasvit Layered Navigation review, it is possible to place a banner on the brand page, whether after the title, before the description, or after the description. In the example below, the banner is located after the brand’s title. The Mirasvit Layered Navigation Magento 2 extension is an easy-to-configure and robust solution for ecommerce sites, which improves navigation experience and filtering through your catalog pages right after the installation. Toolset provided by the module allows customers to combine multiple filters and find the products they need faster. As for the price, Layered Navigation for Magento 2 costs $149 with free installation, 90 days of support, and lifetime updates included.